The answers, once the child learns them, are always adorable. Just try to resist smiling when a child says “Moooooooooooooooo!” It’s impossible. But, it occurred to me early on in this animal sound training that this information is mostly useless. Or is it? Back in November, 2013, The Boston Globe ran an article by Britt Peterson titled “Why teach babies animal sounds.” The piece was prompted, it seems, by the popularity of the viral video “The Fox (What Does the Fox Say),” but it actually goes quite far in answering questions surrounding babies and animal sounds. It turns out that the animal sounds we choose to teach children are culturally specific. Case and point, I’ve never asked my daughter, “What does the camel say?,” but there are Arabic and Somali “words” for the camel’s groan. Instead, in the U.S., we mostly ask about farm animals and woodland creatures, precisely the types of animals that also inhabit the stories we tell children. Yes! Animals act as symbols for human life. Of course this is true, but until I became a parent, I seldom thought of this. I guess when “The Chronicles of Narnia” (a children’s story, obviously) made it to the big screen we all paid a bit of attention to animals as symbols, but honestly, in your daily life, how often do you think about animals, and by extension, nature, in this way? I’ve recently had the opportunity to enter into this world of nature symbolism again in a more adult way – that is, beyond the sounds my daughter is learning to make. 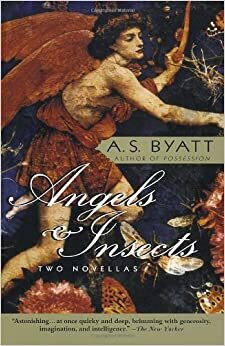 I received my first assignment as a PhD student last week, I need to have read A.S. Byatt’s two-novella book Angels & Insects by next Monday. I’ve finished the first of the two novellas, “Morpho Eugenia,” and I’m absolutely enthralled. Set in Victorian England, “Morpho Eugenia” is the story of a naturalist who is shipwrecked on his return from the Amazon, and, when he finally returns to England, is welcomed into the home of his patron. The naturalist, William Adamson, falls in love with and marries the eldest daughter of the family, Eugenia. It is one of those great stories in which not a lot happens (until the end…no spoilers), but is a page-turner nonetheless. Adamson engages in weighty conversations with the family patriarch about God and origins and evolution, prompted by the recently published ideas of Charles Darwin, and it is remarkable to think that in the nearly three centuries since this time, we continue to have similar conversations. If you’re at all familiar with Byatt’s work – perhaps by way of her award-winning novel Possession – you know that she writes stories within stories and stories about stories. This is the case in Angels & Insects as well. Time and time again we are reminded that “We find parables wherever we look in Nature, and we make them more or less wisely,” as William Adamson writes in his book-inside-the-book (inside the book). Later, his co-researcher, Matty Crompton, writes one such parable, which, of course, is included, in-full, in the text. All of this, the grad school reading and my daughter’s beginning language acquisition, has attuned me to nature and its symbols in a way I have not considered in a long time. This morning, in these waning days of summer, I took her to the beach for what will surely be one of the last visits of the season, and there it was – nature, all around me, rather like a blank canvas ready for me to engage and instill meaning. Except that it’s not quite a blank canvas. As Peterson’s article suggests, a framework of symbolism already exists and what I do when I consider nature is more like remembering than rendering. I’m passing this framework on to my daughter. Every time I ask her what the cow or the lion or the dog or the bird “says,” I’m affirming the parables we will later read as I rock her to sleep. And they are good stories, mostly, and useful. They are our stories – big bad wolves and lost sheep, three little bears and trees planted by streams, lions, lambs, and burning bushes. I love stories, which is why I am eager to resume my formal education. A friend and fellow PhD student once told me that no matter the job prospects, he was happy just to become a doctor of books. Me too. There is resonance, I think, with the recent conversation, here at Patrol and elsewhere, about the broken promise of the internet. That was the story nature told me this morning at the beach as my phone buzzed in my pocket – tweets and status updates, articles and comments begging to be read – and I chose to ignore it in favor of ocean, sand, saltgrass, and sea gulls. And, of course, my daughter, all caw-cawing as the circling birds flew over head.